Hallo! Here's a corgi that I drew from a pic on instagram by @ralphthecorgi. I do enjoy drawing animals. We went to Kyneton today for lunch and had a super big feed of burgers, shakes, beer and fries at Major Toms. I had milkshakes and Rob had beer. 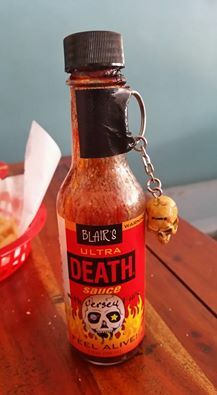 We tried the ultra death hot sauce. This was a bit of a mistake. It felt like the roof of my mouth burned and my tongue was on fire. Truly horrendous. I skulled TWOP milkshakes...a vanilla and strawberry. The vanilla was better. Other than that...it was awesome! A good day. I actually relaxed this weekend and drew things for fun. Hurray! Now to draw for work tomorrow and hopefully smash it.